Caroline and I got back from the 45th reunion two weeks ago and really enjoyed it. Randy Schamberger’s email sums it up succinctly: "Well, we're home from the RTB 45th Reunion. If you didn't come, you missed a great weekend and also missed seeing Air Force beat Army 30 - 10. The weather was great the whole time. Clear blue Colorado skies and warm (well, relatively warm) weather. I shot 5 1/2 hours of video and took over 100 photos. I'm going to try to come up with a 1 or 2 DVD package. When I get finished, I'll get the word out over the Red Tag Net in case anyone is interested in purchasing copies. I don't know what the price will be, but any profit over the cost of materials, postage, etc. will be a contribution to our Class Fund. Thanks." Randy’s email was waiting when I checked my inbox. I saw Randy at the Reunion busy taking videos everywhere he went. I hope he got to see and participate in everything. I’m sure his DVD production will be superb. The 45th Reunion was a huge success. There was lots of time for socializing as well as for participating in Academy events. There were 105 classmates accompanied by (being led by) their Redtag Babes. A couple of men who started with us were there: Kelly Loyacono and Donald Bentzen. We were proud to welcome the widows of three Redtags: Sally Mann, Johnny Brucher’s widow, with husband and children; Sally Fox, Darrell Fox’s widow; and Judy Wood, Daryl Wood’s widow. Sally Mann sent a letter of thanks to Rip Blaisdell who forwarded it to me with his comments, "Duke Green helped arrange for Sally, her husband Greg and her son, Lee, and his family to attend the memorial service and weekend activities at the reunion. Duke and I accompanied Sally and her family out on the terrazzo to see the war memorial after the memorial ceremony. It was a moving event for Duke and I as a well as her family. I think the letter says it all. I’ve been wracking my brain trying to think of ways to fully express my appreciation to you for inviting us to attend the 45th reunion of the Class of ’62, and to attend the memorial service for John and all your lost classmates. The weekend was a life-altering experience for my son, Lee, and me. Lee was able to get to know his father through John’s best friends. When John left for Vietnam, Lee was only two years old, so he has few ways of remembering John, except for a photo album of those six years he was with us, before leaving for the war. Lee not only looks like John, but has his mannerisms and personality…..and his patriotism. Lee is training for a triathlon, so he also has John’s athletic gift. It felt to me as though I was delivering John back to you for that brief time of the reunion, and it was a powerful and emotional experience for me to have some of you share that feeling. Thank you for welcoming us so warmly, for coming over to talk with us and sharing your memories. Thanks for including all of us, my husband Greg and even little Sarah and Kyle. The Class of ’62 wine cork, the stadium blanket, and the etched wine glasses will be treasured. I’m sending this email to Rip Blaisdell, as it seems to be the only email address I have, in hopes it will be circulated and each of you will understand how much your kindness and generosity meant to us. It was a weekend we’ll never forget. There are some of you I would like to thank personally, so if it is possible to get a list of email addresses, I will do that. If that’s not something you give out, I will understand and will hope that you know that you have my deepest appreciation for your love and caring. We look forward to the next reunion and hope our other son, Nick (Lee’s older brother) will be able to attend also. With memories of John….a Red Tag Babe forever, Sally Mann"
Gee, that’s a heart-warming letter. I’m so glad that Sally and her family were able to come. Duke Green, Johnny and I spent our four years in Fightin’ Fourth. So his loss was deep. The first thing about the reunion that struck me was the large amount of time devoted to Nothing. That was great. We had plenty of time to get updated with each other again. "ThaRipper" said that the reunion committee planned it that way; they didn’t want to entertain and educate us. They felt that if we had the time we could find ways to fill it ourselves. Many Redtags felt that the Reunions get better every year. So the 50th should be a blast to end all blasts. The Thursday dinner at Solos was dynamic. The KB-97 airplane out front was nostalgic for some of our oldest classmates (not me of course). The buffet facilitated conversation on the waiting lines and got things rolling. I think I would have enjoyed Tuck McAtee’s demonstration of being able to speak words backwards, but I couldn’t understand a word he said. Sorry Tuck. I hope those two gigantic bouncers (Butch Viccellio and Jack Swonson) who escorted you away from the microphone didn’t scare you too much. By the way, Tuck, hold onto your day job. The Friday morning briefing at the AOG Hqs was very informative. Jim Shaw gave us a good rundown on how the AOG stands now. The Class Memorial Paver was dedicated outside the AOG Bldg. We also saw the Heritage Walk and Challenge Bridge nearby. Then we were bussed to the cadet area to visit our old cadet squadron haunts. It was a walk down memory lane to see my old room. As happened last reunion, I saw some changes in the way rooms and areas are presented. No problems; just different. We enjoyed the talk with the cadets. They were in awe of us when we told them that we were the original Redtags. They made me feel like a celebrity. 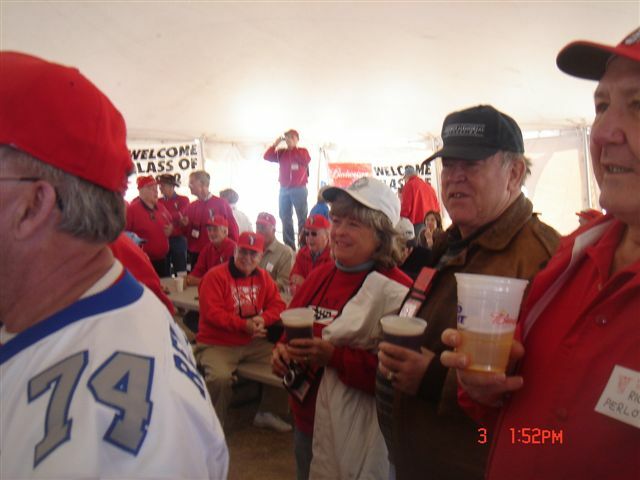 <--------- BOB STAIB & Wife with CHUCK LARSON. We got the same reaction at the lunch table. It was great telling them how we misbehaved during our Doolie Year. And how we pulled together. From there we went to Fairchild Hall and heard from the Supe and his staff. He gave a good briefing on the scandals, the code, present status and future plans and programs. Then we zipped over to the Chapel for our class picture. The Photographer arrived early as did a bunch of us, so he took the class pictures before a few stragglers got there at the appointed time. I hope they can paste in pictures of the absent ones. Then we had the Memorial Ceremony. As in years past, it was solemn, tearful, uplifting, beautiful and memorable. A toast to them all! By the way, the Memorial Ceremony pamphlet was an outstanding piece of artistic memorabilia. The evening was a sumptuous dinner at the Marriott. We heard from several of our classmates who recalled some memorable events from the past. The following day started with the Tailgate Party at the stadium. The tent was great. The food tasted delicious and the camaraderie was, as always, delightful. The cheerleaders came into the tent before the game and led us in several cheers. See accompanying picture. Then we started the long trek to our seats on the opposite side of the stadium about halfway up the mountains to what seemed like the 15,000 foot elevation. Actually, it was about 300-500 feet up. But we swamp dwellers from Florida get a nose bleed when we go up to the 10th floor in buildings. We survived. It was a great game. A B-52 flew over as did a pair of fighters. The sky diving team AOC delivered the 1962 flag to the center of the field. After it was over, we had wupped Army 30-10. Then back to the hotel for a finishing dinner and more socializing. Of course, after dinner some people who had been on cruises recently, started the fun game of sticking spoons to their noses. 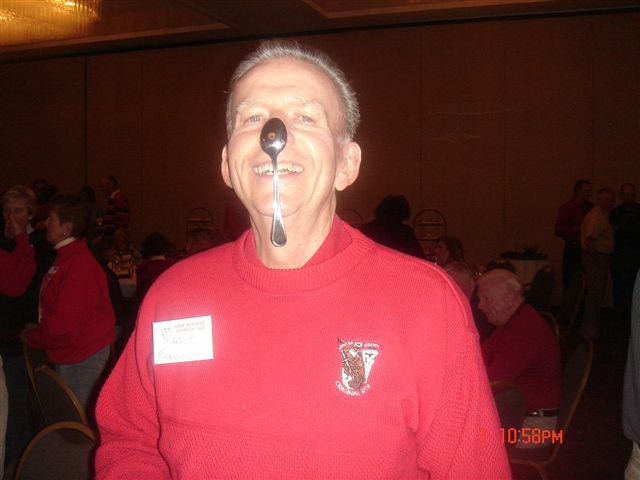 What a sight: people bragging about being able to have a metal spoon stick to their nose. It’s a good thing we will all be retired soon. The next day, Caroline and I had to get up and catch a 6:30 AM flight out of C Springs. We sure enjoyed the reunion and look forward to 50. Before the reunion I had received some emails which I’ll share now. From Gail Peck: "First item to report is a great dinner Carol and I had earlier this summer with the Altmans and Butchkos when Rick Perlotto and Kathleen came to town for Carla Perlotto's graduation from UNLV with a PhD. CONGRATS Carla! Didn't see Carla and her family but the Vegas crowd really enjoyed seeing Rick and Kathleen. I went to the Experimental Aircraft Association air show at Oshkosh with Rick Perlotto in July. Great time. Then, in early August Bob Deberry showed back up in Vegas and Hesh and Bobbi Altman and Carol and I joined him for dinner. Georgi Deberry went to see the Beetles show at the Mirage so we missed her. Bob was last seen heading into Vegas traffic trying to follow Bobbi, Hesh and my instructions on how best to get to the Mirage and pick Georgi up after the show. If that all worked and he is not lost forever we will all see each other again at the reunion. Other than those Red Tag encounters, life has been quiet with the "W" (work) word dominating Carol and my lives. I still fly the Cessnas with the CAP and also my own Turbo Cardinal RG. Since I like to have the same number of golf balls Sunday evenings that I started the day with, I have given up golf attempts and am building an RV-8 airplane. Kind of an adult erector set. See you this fall. Love to Caroline. Gail Peck 1225K." Thanks, Gail. We did get to see Gail and Carol there. I also got an email from Shep. Jack –" Rose and I spent July at a horse ranch in western Colorado to get out of the Tucson heat and got into the Colorado heat. 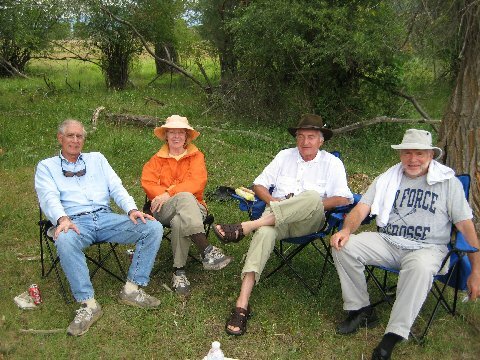 We were visited by Erv and Pam Rokke, Jim and Penny Mack, P.K. and Reta Robinson and Rudy and Betty Bow who brought their massive RV - a good time was had by all telling RTB stories, drinking cheap wine and beer and fishing - here's the proof - Shep: "
See accompanying picture. Thanks, Shep. Saw all of them at the reunion. Got this from BO Ohman. 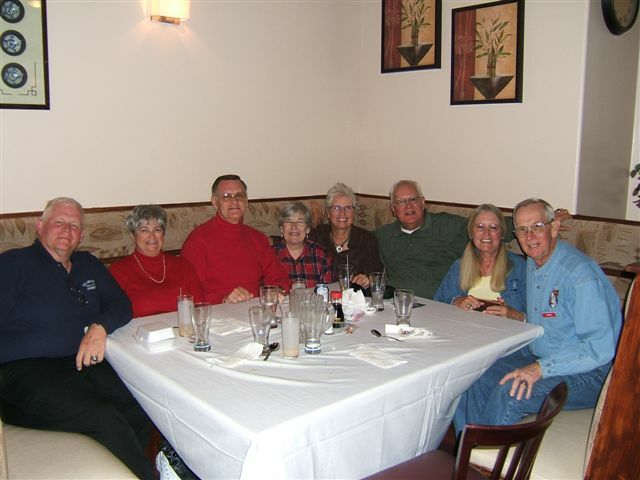 "Jack, I'm stealing this picture from Jerry Cornetet, but here's a caption: " Bo and Nancy Ohman, Don and Mo Netzinger, Jerry and Val Cornetet and Kinney and Nan Smith took time out from a great reunion to reminisce about Colorado Springs days in 1961-2. We also used the location of an oriental restaurant to remember the SEA days." BO, Thanks for the picture. It was good seeing all of you there. A Funeral and Memorial Service was held for Maj John Carroll, Class of 1962, Cadet Squadron 12, who passed away on 17 Nov 1972 . 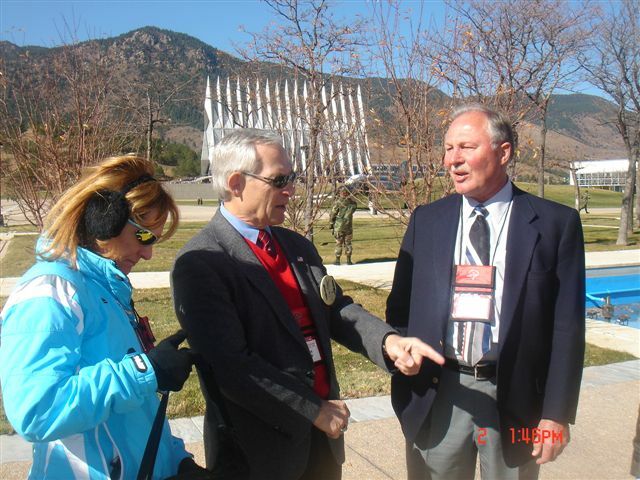 The Funeral was held on 13 November 2007 at 1000 hrs at the Cadet Catholic Chapel, USAFA. A graveside service was held immediately following at the USAFA Cemetery. There were 12 to 15 Redtag classmates in attendance, as well as several Raven FACS and other FACs, members of the Academy staff and about 50 cadets. A reception followed at Doolittle Hall (AOG) to celebrate the recovery of Maj Carroll's remains. Rip Blaisdell said that it was a beautiful and moving ceremony. One last Reunion item: There are about 20 coaster sets and several wine bottle stoppers still available. I’m going to get another coaster set; the crest design is gorgeous. Wine glass sets can be ordered also. Just contact Rip and he’ll help. Also be aware that there are four years and 11 months until the 50th Reunion. Mark your calendars. Now. You don’t want to miss that one.